Chicago Mayor Rahm Emanuel and his DOT head Gabe Klein have introduced a bold, 100-page plan to make the Windy City’s transportation system more safe and sustainable. 20 mph zones in all the city’s residential areas. 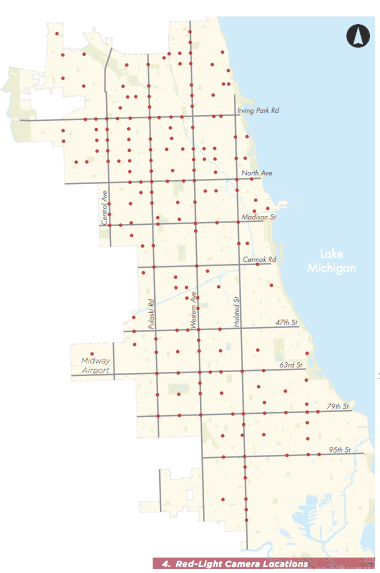 To achieve the safety targets, the plan makes a commitment to address problem intersections, calling for the city to “analyze all fatal crashes involving pedestrian and cyclists” and improve the city’s top 10 traffic collision locations annually. The city’s ability to install speed enforcement cameras — recently granted by the state legislature and City Council — also figures prominently in achieving the safety targets. The document reinforces the city’s promise to invest in new infrastructure to improve bicycling and transit, including the already-stated goals of building out protected bikeways and high-quality rapid busways. Among other projects, the plan calls for the installation of 500 new bike racks per year and 100 transit-priority traffic signals. The city will be reporting regularly on its progress toward the stated goals, said Klein. Philadelphia is removing its bike lane in Chinatown because it might slow down traffic a bit. We’re like Chicago, right? Alright, so it’s game on! Who can be the first American city to reach Vision Zero? Ready… GO! Did you hear me, NYC? Go! NOW! We can’t lose to Chicago! Good for you Chicago! I wish our mayor took safety as seriously as does Chicago’s mayor and dot chief. Zero deaths is just rhetoric, but it’s helpful — it dares other cities to set the bar high and stop accepting traffic fatalities as inevitable. Almost 33,000 people died on U.S. roads last year and the DOT called it progress. Two states — Washington and Minnesota– already have versions of vision zero. It would be interesting research to see whether that has led to a reduction in fatalities, or a faster reduction than the national average since the articulation of those goals, given that U.S. road deaths have been coming down sharply in recent years. Chicago presently has about twice the annual traffic deaths per capita as NYC, which would be nice to keep track of given this readership’s preference for rhetoric over reality. The major reason many more people do not use net zero and near net zero mobility is because of the extreme danger of transportation systems based on cars; also the major way this extremely destructive method of travel secures its monopoly. This destructiveness, social justice, and the extreme value of human life — it is truly bizarre that this requires affirmation — is why zero deaths initiatives are so important. What we are talking about is making manmade vehicles and environments totally safe which is ultimately an easy problem to solve. You just build them safe. Broadly deployed net zero mobility is a major solution to accelerating climate change that increases the quality of life; and it makes absolutely no sense even considering moving the current 1/2 billion cyclists in China and elsewhere to transportation systems based on cars. “Vision Zero” or a variant thereof has been adopted by many places, from Sweden and Australia to even Dubai. In the USA, the “Toward Zero Deaths” campaign has led at least six states to pledge to work towards eliminating road deaths. I’m not sure what “near net zero mobility” is, though. Payton, If walking is considered some sort of energy & greenhouse gas emissions baseline, where bicycles are about 3-4 times more efficient than walking, normal cycling should be considered net zero mobility as well as walking. Near net zero might apply to vehicles that use a bit more technology with slightly larger environmental foot prints by incorporating auxiliary powering and other stuff perhaps to carry larger loads, etc. ; also special systems footprints might also be considered providing much higher functionality with collision avoidance, powering, much higher performance, etc. ; all of which should have minimal environmental footprints, build-out emissions, and very close to net zero energy usage or better.